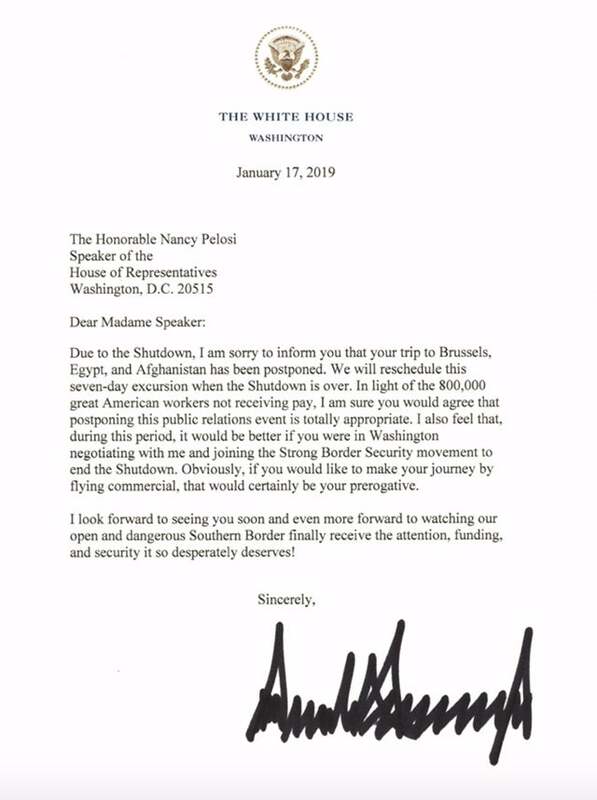 Trump Strikes Back, Cancels Pelosi Trip! RUSH: Well, look at this. From Fox News. “President Trump today –" ha-ha-ha. You’re gonna love this. You are going to love this. President Trump today appeared to deny military aircraft to House speaker Nancy Pelosi for an upcoming foreign trip. This in response to her call to the latest State of the Union address amid the government shutdown. See, folks, do you think Romney would ever send a letter like that? (laughing) McCain? Kasich? No way. You know what they would do? “Despite the fact that you have canceled my State of the Union, I want to show the country that we are reasonable people. And if you want to fly to those three places, we will gladly furnish you military aircraft.” And Pelosi would just say they just got suckered into letting me have what I want again. And they think they're gonna be able to buy respect with this but they're just a bunch of idiots and buffoons and they prove it every day. And Trump says, sorry, you have to postpone your trip. RUSH: By the way, folks, the Trump letter to Pelosi is legit. It is real. Trump denied her military aircraft to go on her seven-day trip to Brussels and Afghanistan and Egypt. Here's the kicker. She was to leave today. 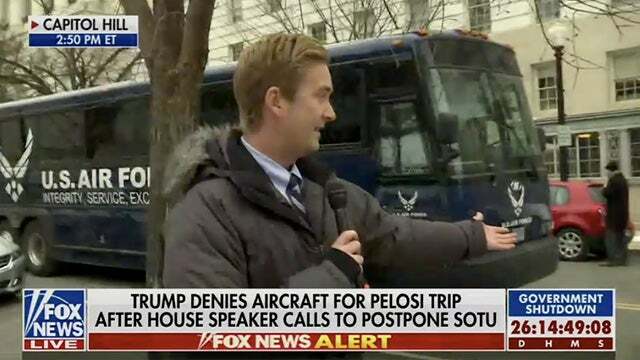 And I think Fox News is covering this near the buses where Pelosi's entourage was supposed to leave and head to the airport. That letter I read is legit. He's postponing her trip, sure she understands, government shutdown and so forth, she should stay in town to negotiate. There's not a single other Republican with the gonads to even get close to doing this. It's the real thing.